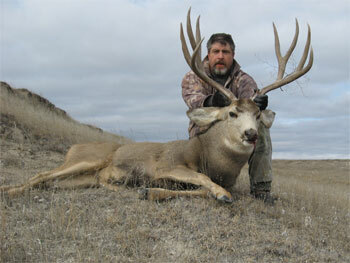 Hunting South Dakota public lands for a mature buck can be a long intensive process. This is the reason I took two weeks of vacation for our West River Deer season. The weather has not been cold enough to push them into an early rut, with daytime temperatures in the 40s. The first week of the season, I was seeing a lot of immature bucks with small herds of does and yearlings. The wind was terrible, with gusts up to 40-50 m.p.h. Typically the type of areas I hunt are large plots of ground with an upper table, with parallel, non-vegetated ridges that work down to a drainage system at the bottom. The plots of ground are extensions of the Badlands, but lie in the National Grasslands. During a good year, we will receive 16-18 of moisture, and half of that is in snowfall. It is seldom the creeks that run through these areas actually flow with water, but often have pools of water. As far as their main staple, the deer forage on prairie grass. This is not good farm ground, and it is many miles to the nearest crop. I have no idea how a buck can grow as much wood on their head other than good genetics. Now I am in the second week of my vacation, and I have not seen a single mature buck. I am seeing a lot of herds of does without bucks, and I have noticed a few gut piles where two and three pointers were a week before. Time is running out. I only have two days left of vacation, and one of them is Thanksgiving. I headed out early enough to get to a feeding area in the dark. It is cold out, but the winds are light. I counted 35 does by 10 am, but not a single buck. I refueled my pickup at Wall, and dug out my National Grasslands map, and found the road that led into the creek bottom I wanted to hunt. The creek bottoms here in this area are nothing like any other. There is no water, and there is no vegetation. So why would one want to hunt it? Thats easy. The creek bed is 3-15 feet wide, and on the average 3-8 feet deep, and near vertical walls. This makes a great wind break, and provides a place for these mature bucks to travel through the rough breaks with little effort, and undetected. I was walking on the flats above the creek, and taking advantage of the elevation changes of the ridges to glass ahead. It was the same story, lots of does and yearlings, but no bucks. I was ready to turn around and head further east to a different creek that had water and vegetation, but decided to look over a couple more ridges. I topped the next ridge and there were three deer bedded down in the creek bed. They were 350 yards away and looking towards me. The one on the right was a big, mature five-point buck. If they had not detected me I would have ducked down and snuck up for a 100- yard shot, but with their heads turned in my direction, I had to assume I had been picked off. I put my bi-pods down and looked at the ballistic charts taped to the side of my gun. It was a slight downhill shot, but my crib sheet told me to hold 15 high, and 2 to the right to compensate for the slight breeze. I cut the vertical compensation almost in half to compensate for the downhill shot, and squeezed it off. Not looking in the scope for impact results, I extracted and replaced another .243 shell. Now he is broadside and standing. I held just over his back above and behind the shoulder, which was the last still shot I had. I watched him buck as he took off on a run. He went back down into the creek bed out of sight, but the two does gave away his position. I ran toward him and cut the distance in half and shot two more times. When I field dressed my buck, I accounted for all my shots. I am sure it would have been a successful harvest after the first two shots, but every step the buck took was that much further I would have to drag him, and he was the only mature buck I had seen in the last two weeks. I drug the deer South to a fence line that was about 400-yards away. I walked back several miles to get my pickup and drove as close as I could. I had another short drag, and loaded the muley into the truck. 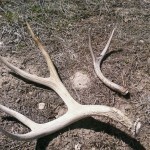 I drove home an exhausted, but happy hunter, knowing I had just bagged one of the best muley bucks of my life. That sure is a beautiful muley buck, great shot. What a story dragging it all that way. I am hunting http://www.peartreegameranch.com this week. I hope to have a great story about what I shoot. Thank you again for the great story.